His great-Uncle Ian told him everyone in Glaston knew about the Shrine but no one would say much about it. Terry Walker had only met Uncle Ian once before and that’s when he was only six. His mother’s uncle had made a rare trip across the “pond” to visit the last remaining member of the family. Mom couldn’t have any more children, so whatever legacy Ian Lawrence possessed would go to Terry. When Terry graduated from UC Santa Barbara, he decided to take a year off and travel. Uncle Ian was now quite elderly but very welcoming when he wrote him saying he would like to visit (the old man didn’t even own a computer so emailing was out of the question). There were only about eighty households in Glaston plus a public house, but unlike most of his age mates, after a hectic four years at university amid the Southern California sprawl, and then a lengthy sojourn in several European countries, he was looking forward to some quiet study in an idyllic setting. Terry had a Bachelor’s in History with an emphasis in 18th century Europe and he was especially interested in visiting the historic St. Andrew’s church. Ian had formerly been the Deacon at St. Andrew’s and had preserved a number of the church’s important papers and artifacts, some dating back to the 15th century or earlier. He still kept some of them in his home library which is how Terry discovered the existence of the Shrine. The student had spent days immersed in his uncle’s library, which was comfortably appointed and in addition to the stone fireplace, was lined floor-to-ceiling with bookshelves. Among the numerous tomes, one small book captured Terry’s interest. It had no title and was handwritten, though it left no clue as to the author’s identity. The few pages in the book spoke of the Shrine. described its location, and issued a dire warning against visiting the ancient cairn. But if his uncle had collected it and kept it in his home rather than make it publicly accessible in church library, it must be important. “I tell you Terry, this is nothing you want to concern yourself with. You’ll be better served by a study of St. Andrews. Nothing good will come from visiting the Shrine. No one in these parts have laid eyes on it in who knows how long.” The octogenarian’s hands shook as he lifted his cup of tea to his lips. They were sitting in front of the library’s fireplace warming themselves against a cold, wet late winter common in the East Midlands. “As a warning, Lad.” Ian set the cup down and placed his hand gingerly on the book which was sitting on the small table between the two men. “To whoever comes after me, Terry.” Ian picked the book up with an unsteady grip as if to ward off Terry’s interest. The young American pondered his Uncle’s words for a moment. It couldn’t be for the current or a future church Deacon. He was the only one who was going to come after Ian, at least as far as family was concerned. Terry gently took the book from his uncle and slowly turned ancient pages to verify what he already knew was true. Most of them had been removed and long ago. “What happened when you did it?” It was a bluff. Terry had no idea if the old man had done the forbidden, but the look on his face in response to the question revealed the truth. Uncle Ian had ignored the warning. He visited the Shrine. He lit the candle. It rained for the rest of the day, but the clouds broke the next morning. The old man was still sleeping when Terry set out. The weather was bitterly cold, especially for someone used to Southern California in February, so he borrowed one of his uncle’s heavy coats as well as gloves and boots. He walked along the road until he was the closest he was going to get to his destination by that means, and then went across country. At twenty-three, he was strong and he enjoyed running and hiking, so besides the weather, it was an enjoyable excursion. It didn’t take him as long as he thought to arrive at the Shrine. It was roughly five feet tall possessing a crude cylindrical shape. On the front there were carved designs that looked like birds and he imagined three swans, though he didn’t recognize the period or culture that might have produced them. Above the bird carvings was a smooth area in the rough stone, as if there were meant to have been a plaque or inscription, but time or some vandal had worn any away any message it may have contained. Toward the top, there was a triangular indentation. A metal structure, probably bronze, had been inserted. At the bottom, there was a smaller triangle containing a candle and above that, numerous round holes punctured the metal, perhaps to release the smoke when the candle was lit. If no one had been out here in decades, why did the candle wax and wick look fresh? Sunlight broke through the clouds but Terry and the Shrine were sheltered by the surrounding trees. His fingers were freezing, and he took off his gloves so he could use his breath to warm them. When he put a glove each in his coat’s left and right pockets, he felt something in the right. Terry pulled out a book of matches. Ian told Terry that he’d finally had to give up his beloved pipe tobacco after a lifetime of smoking because of the cancer. He was in remission but his doctor was very insistent that the old man not return to the habit. Either Ian was cheating (though Terry had never seen his Uncle smoke nor smelled the scent of tobacco in his home) or the matches had been leftover and forgotten. Terry held the box of matches in his hand. The breeze that had been chilling the young man became still as high clouds once again obscured the sun. Terry looked close at the candle and area around it. Clearly it had been lit before. Melted wax that had run down the sides and formed a now solid pool at the base. He could see the metal had darkened due to heat and smoke. Examining the smooth panel just below, he could barely make out some markings but they were too faint to decipher. He was still holding the matchbox. Terry opened it. Five matches left. He’d only need one. Terry wasn’t religious or superstitious. Whatever Ian thought happened to him had to be a fantasy. While he was captivated with the history of 18th century British and European cultures, including the influences of Christianity, it was intellectual study to him, not a lived reality. Terry took a match out, closed the box and held the tip at the striker. It was as if the Shrine were waiting for him, a ridiculous thought really. Maybe it was daring him. Maybe this whole “warning” thing was his uncle daring him. That had to be it. After finding the book and then their conversation yesterday, did Ian seriously think Terry wouldn’t visit the Shrine? He struck the match fearing it was too old to ignite, but the tip flared on the first try. Still no breeze to disturb the flame. He reached his hand inside the aperture and touched the match to the candle wick. A wind picked up and the tree branches moaned and creaked above him like an old soul. The wick caught and the candle was lit. Ian Lawrence woke suddenly rather than in the usual slow and casual manner. “Terry.” He knew what had happened and now he knew it was too late. Terry Walker was in the middle of an ice field surrounded by jagged rocks. How had it gotten so cold so fast? There wasn’t supposed to be a snow storm. He dropped the match and wrapped his arms around his body. He could barely see the Shrine in front of him but he could see the fire at its base. Had he somehow lit the grass? People. Men. Not men. They were wrapped in thick furs, uneven, layered. Their speech sounded more like grunts. Hands grabbed him pulling him away from the Shrine, only now he could see it wasn’t the Shrine anymore. Same height, made out of stone, but no details. Rough rock. A wood fire was burning at its base. Where was he? Terry was too cold and frightened to resist as the group of five or six continued to pull him away from the artifact. There were animals nearby. Oxen? Several were hitched to crude sleds. One of the men brought furs from one of them and wrapped Terry, trying to warm him. He was laid down onto one of the them then covered with more animal skins. The man, if that’s what he was, securing him to the sled stopped and spoke in a language that was completely unrecognizable. His face looked plain and primitive, but his expression was a mixture of kindness and concern. Another man approached him and he stood. They had a brief conversation and his nursemaid left. The other bent down over him. “Yes, well I’m an American, but I speak English.” Terry noted the man had a strange accent. What country? How could the Shrine have been responsible? “You come. Safe, English. We make safe.” The large stranger bowed to Terry out of what could have been respect or even worship. Then he began his journey into the unknown, a journey last taken nearly sixty years ago by another “English” named Ian. If the cancer didn’t return or some other tragedy of old age didn’t claim him, Ian thought he might still be alive five years from now when Terry returned, assuming he lived through the fantastic experience. He poured himself a cup of hot tea and sat before the fireplace. His hands were unsteady but he was still strong enough to carry in a few logs and light the tinder. His robe was soft with age but still thick enough to insulate and comfort him. He stared unseeing into the fire, recalling his own entry into the last ice age in what he found out was called the Pleistocene. He looked everything up when his own journey through time ended after a long five years and put the pieces together. First, he was deposited at the foot of a stone pillar about 11,700 years in the past. Rough men, perhaps the last of the Neanderthals took him in and cared for him, even worshiped him as a god. A few knew English, probably from previous travelers who had dared light the candle and opened up the gateway to the past. Every six months for the next five years, Ian made a slow progression forward. From around 10,000 BC, the next stop was maybe 3,800 BC, the previous year divided by two. Then divide by two again and he found himself in 900 BC, then in the 6th century, the 13th, the 19th and so on. Every six months he made another leap forward. After dressing and a small breakfast, Ian sat down with a pencil and paper and attempted to chart Terry’s likely forward progression. The old man started on a fresh piece of paper. “Now I was born in March 1935 which means Terry will appear here twice during my lifetime. I’d gone missing between 1957 and 1962. Good thing old Mum and Pop were still alive when I came back. 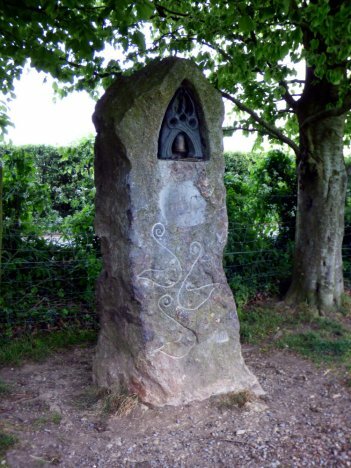 Terry will always appear at the base of the Cairn which later became the Shrine. I wonder if we ever met? I wrote this for the Thursday photo prompt – Shrine #writephoto challenge hosted at Sue Vincent’s Daily Echo. Each Thursday, Sue posts another of her photos and asks that anyone who cares to write a poem, short story, or other creative work using the image as a source of inspiration. Sue asks that if we know where the photo was taken, not to reveal it until the week of the challenge is up, but when I downloaded the image and saw it was called “glaston-ma-day-dianan,” I got curious. Googling the entire phrase didn’t return anything meaningful, but I did discover there’s a small village called Glaston in the county of Rutland in the East Midlands of England. Archaeologists working in the parish in 2000 discovered a late Pleistocene (c. 30,000 b.p.) faunal assemblage in association with an Upper Palaeolithic flint “leafpoint”. I magnified the photo as large as I could while still being able to see details, which gave me a description of the Shrine. It actually doesn’t look particularly sinister, but for the purposes of my story, I had to make it seem so. However, as I was writing the tale and authoring warnings and mysteries, a simple trip back in time over 11,000 years and then returning didn’t seem to a sufficient challenge, so I got out my trusty Windows calculator and started halfing dates in the manner described at the end of my story. In ten jumps, a person could cover a lot of history staying six months in any one time period, and then finally returning to the present five years hence. That, I decided is what happened to Ian, and now it has happened to Terry. Others have apparently taken this journey as well, perhaps many times over the centuries. I decided to keep the nature of the Shrine and whatever came before it a mystery, although it would be interesting to find out who wrote the book Terry found and did he or she know the secret of the Shrine? I had to look up an ancient world history map to confirm that the glaciers of the last Ice Age probably reached as far south as Glaston. When I was little, I was in the Cub Scouts. I received a regular magazine from the Scouts called “Boy’s Life.” I remember reading a comic strip in that monthly. I don’t remember what it was called, but a modern, Native American archeologist was exploring a cave and somehow was transported back to the Stone Age. He had some adventures and then ran back in the cave which took him into the future but only a little bit. In this manner, he visited the evolution and development of his people from the ancient past and across time until finally returning to the present (which is where the story line and comic strip ended). I think it was meant to be educational, teaching we boys about the history of the indigenous people in America. I wish I could find the story series again. There was another strip in the same periodical about an interstellar spacecraft that had a faulty jump drive causing it to appear at random locations in space in random time periods including once at Earth right before its launch. I’d like to find that one, too. Apparently not, Sue. Fortunately, what it really means still escapes me. Glad you liked the story. I keep thinking of possibilities even now after I’ve put it online. Fascinating idea James. I’d take the five-year journey if it was offered to me. If you took a look at some of those dates/time periods Iain, I’m sure you recognized most were very primitive, so there’s no guarantee that you’d survive living there. It seems the Ice Age people revere these “gods,” but there would be a lot of dangers, including from disease going forward. That said, if you were young and the adventurous type, it would be quite a ride. If you can find the Shrine, light the candle and go for it, Iain. Then email me in five years and let me know how it all went. Yes lets let Ian do the travelling… excellent story! Ha! We’d have to wait a whole five years to find out if he made it or not. Thanks, Willow. I don’t think he minds. He really wants to go. I’m a bit too old for such a thing anymore and truth be told, I’m not the adventurous type. For the right sort though, it would be an incredible ride. Just imagine how much living history you’d be able to experience and how many questions you’d find the answer to. Yes truly amazing but like you I am getting too old for danger lets send Ian!! That’s true but remember in each of those times, people thought they already had the best of things. Even in the Ice Age, a shelter and fire were probably thought to be great wealth. Ooh, I had goosebumps from the moment Terry lit that candle, and they’re still here now! I bought the entire thing; this could actually have happened. I bet it DID happen. Great story, James! LOL. Could have actually happened and did happen? Well…maybe. Thanks, Spaceman.